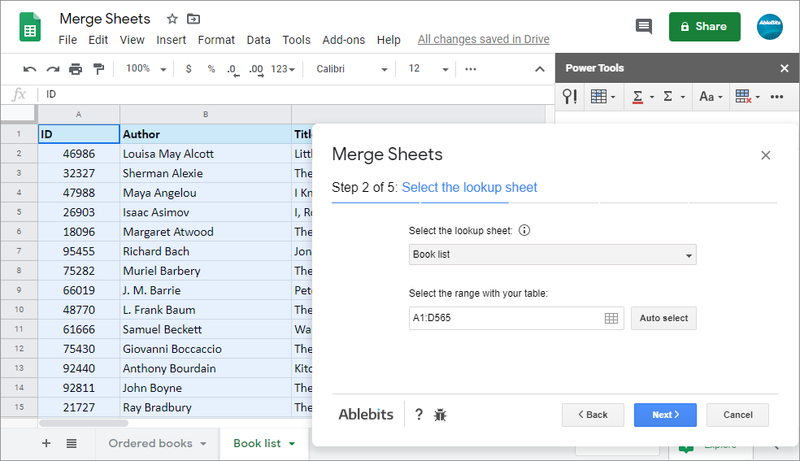 Merge Sheets is a replacement for VLOOKUP and INDEX/MATCH functions. The add-on simplifies the task of combining data you have in two different tables. 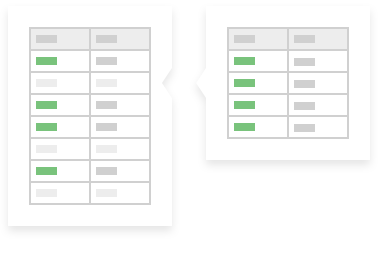 It scans and matches key columns in two sheets that you specify, and gets all the necessary updates into your main table. Set the tool to update only new and/or empty cells and pull non-matching rows from another spreadsheet. 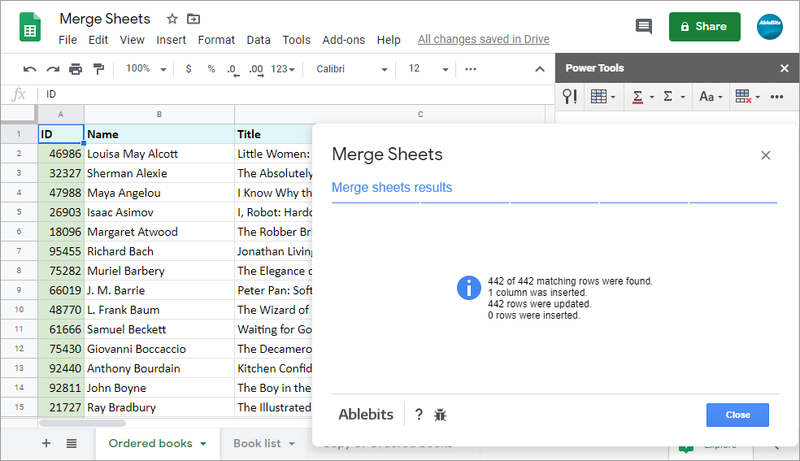 Combine two Google spreadsheets Match and merge records from two spreadsheets into one without formulas and copy-pasting. Update records in the main table Identify your main and lookup sheets to fetch the correct data. Add only missing records to your table Update only empty and new cells in the main table. Change the color of the updated cells Clear the background color of the results or highlight all changes with a hue of your choice. Use one or more key columns for matching values Even if the column order is different, the tool will detect the same data and retrieve updates for it. Save the rows with unique entries Add non-matching rows to the end of the main table. Update only if lookup cells contain records Prevent overwriting your values with blank cells. Identify changes in a status column Add a helper column to get a better view on changes or even sort and filter table according to the status. 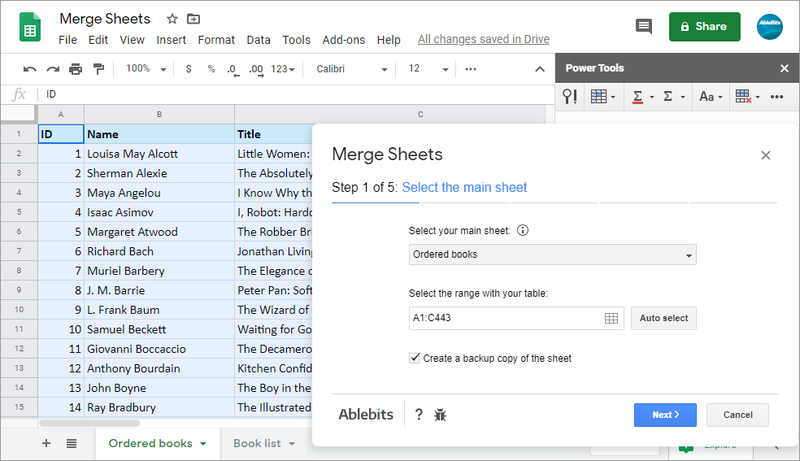 What is Merge Sheets and what do I need it for? 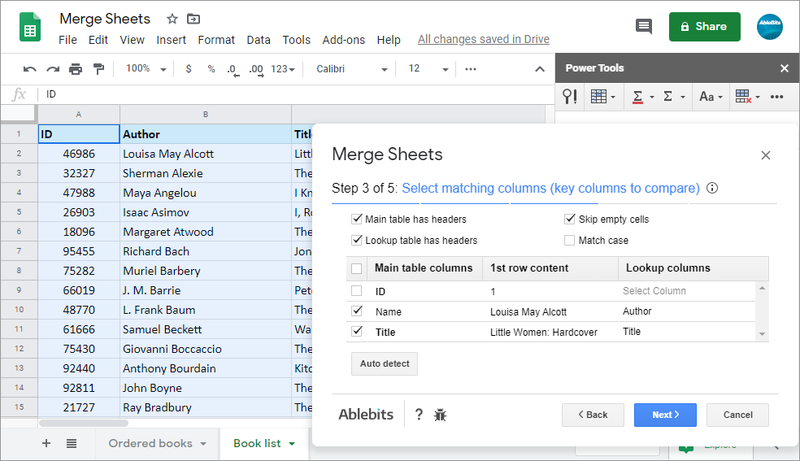 Merge Sheets is an indispensable tool for matching and merging records from two sheets. The add-on matches the records from the columns you select and updates your main table with the corresponding data from the lookup table. You can update the entire main table. Add unique rows from the lookup table to the main one. Fill only empty cells in the main table. Update only if cells from the lookup table contain data. Isn't there a free way to join two Google spreadsheets? You can always go with the VLOOKUP or INDEX/MATCH functions to combine two sheets. However, practice showed that these are difficult to understand, and we haven't even mentioned that they can be combined with other Google functions to make your lookup criteria more advanced and flexible. Our tool offers 5 simple steps that will take about a minute of your time to adjust the settings. 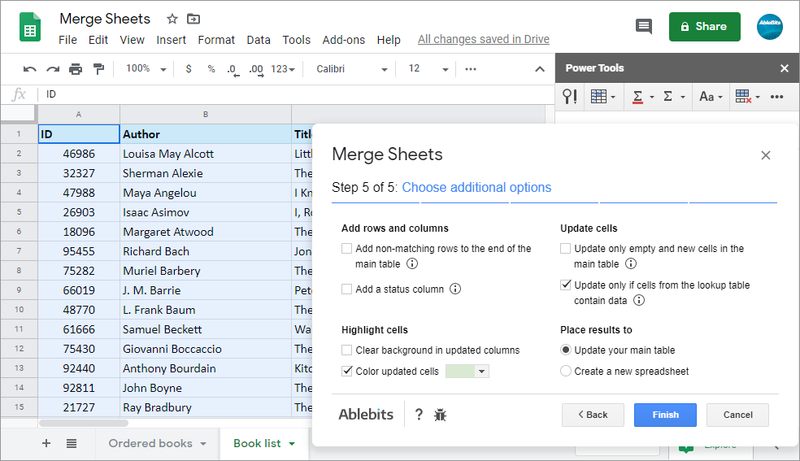 How to merge two Google sheets with your add-on? Choose key columns - columns that match in both tables. Decide what columns you need to add or update in the main table. My tables are quite large, how can I track the changes? Merge Sheets can color the changes for you. Once you choose the corresponding option on the last step, you'll be offered a palette with different hues - pick the one you like and enjoy the results. If you don't like the colouring, make use of the status column. It will be inserted to the right of your table indicating the type of values - updated, new, matching, etc. What if one of my tables doesn't have headers or the columns are placed differently? No worries, we've got you covered. You'll be able to choose whether your tables have headers and what columns to update with the data. I don't want to update the entire table, I only need to pull completely new rows. 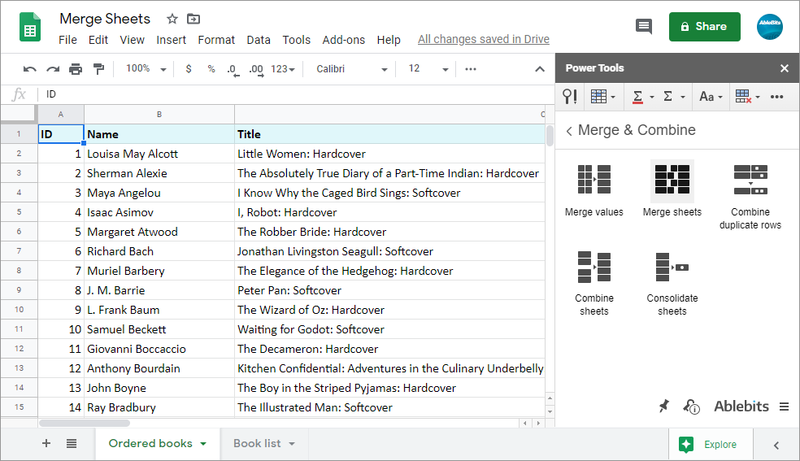 For that, simply skip the step of choosing columns to update, and head straight for extra options - Add non-matching rows to the main table is the one you need. How will your add-on handle empty cells? Will it overwrite my data with blanks? That again depends on the options you select. :) Have Merge Sheets to fill only empty cells in your main table or don't pull those blanks from the lookup table.